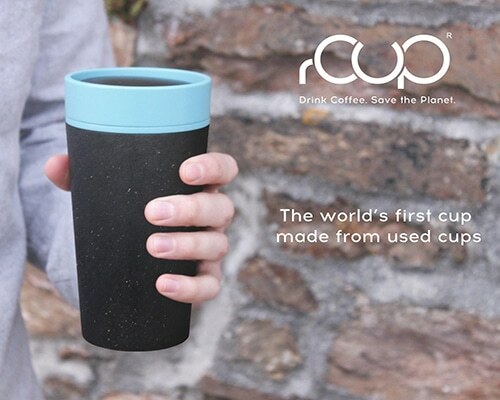 rCUP – a reusable cup made from used paper cups. rCUP joins several single-use and reusable cup options with Sustainable attributes at the fore. The world’s first reusable cup made entirely from used paper cups has been designed and developed in the UK by recycling industry experts and is available to the foodservice industry now. Branded rCUP, each reusable cup is made from 6 used paper cups, is BPA free* and 100 per cent recyclable. In 2016, a BBC documentary called War on Waste, made public that paper cups were not being recycled despite being largely made from paperboard. Paper cups are not easily recycled due to several factors: a waterproof plastic lining, high levels of foodservice debris contamination, lack of specialised recycling facilities and a low market value for recycled paperboard. The foodservice packaging industry has taken steps to make paper cups widely recyclable, investing in recycling infrastructure, more on-the-go collection points and the launch of an innovative paper cup with 48% less plastic than a standard PE lined paper cup. Because of a significant investment in the ACE recycling facility, PE lined paper cups are now more widely recyclable. They also continue to be accepted through the Simply Cups collection and recycling scheme. Many customers in the foodservice environment are looking at the option of reusable cups to complement or even replace their single-use provision, where it is practical to do so. Reusable cups are an environmentally responsible solution when a single-use product is not required, and Bunzl Catering Supplies has been actively sourcing and presenting several reusable cup options to its customers – the latest being the innovative rCUP. rCUp is the world’s first reusable cup made entirely from used paper cups, designed and developed in the UK by recycling industry experts, every rCUP is made from 6 used paper cups, is BPA free and 100 per cent recyclable. Due to being predominately made from polypropylene, this product can be placed in mixed recycling at its end of life and can be identified and segregated at the Material Recovery Facilities. Bisphenol-A, or BPA for short, is a chemical that can be added to certain commercial products, including food containers and hygiene products, to increase the structural integrity of the product. However, BPA is considered to have toxic properties and so it is important to use products at are BPA free. The rCUP is unique, not only is it made from used cups and 100 percent recycled but it also boasts several other clever features, being 100 per cent leakproof with a unique push-push opening mechanism, the rCUP drinks like a normal open mug, allowing users to enjoy the full aroma and taste of the beverage. Insulated to keep the contents warmer for longer and for a comfortable hold, the rCUP is also completely dishwasher safe. The rCUP is available in four colours white – teal blue, white – earth green, black – mustard and black – teal blue, it can also be custom printed. For more information about the rCUP or any of our disposable or reusable cup options, please contact us today – we look forward to hearing from you. If you’d like to view our Sustainable Future factsheet on cups – please click here. Our partner supplier Huhtamaki has launched an initiative aiming to increase cup recycling within the UK. Made from 80% rice husk and 20% plant resin, ECO to Go joins a larger range of both single-use and reusable cup options with Sustainable attributes at the fore.